This easy and veggie-ful couscous salad makes the perfect Easter side. I love making recipes that are also gonna be rockin’ leftovers. I’m kind of a leftover junkie. Although I love to cook – I also have a life too! When I’m creating a recipe it has to meet certain criteria. It has to be healthy, it needs to be fast, and it has to taste just as good or even better the next day. This is one of those recipes. It’s a keeper! 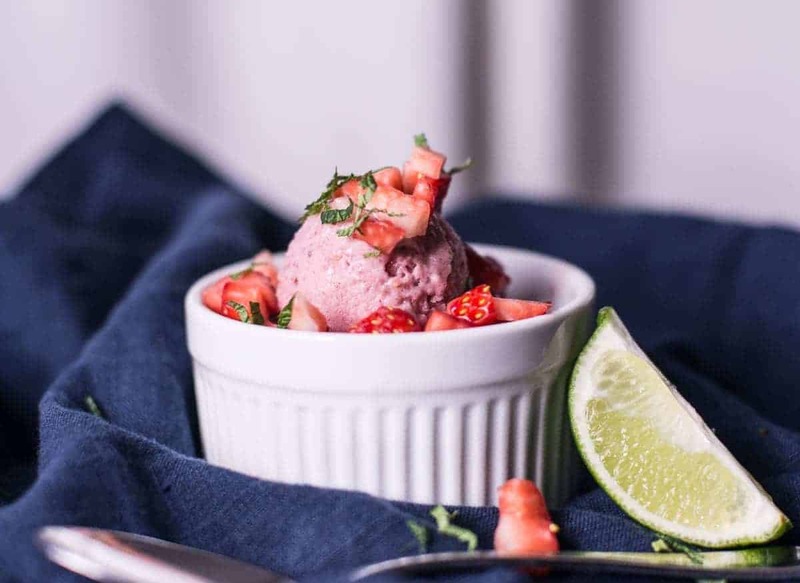 Colorful and delicious! 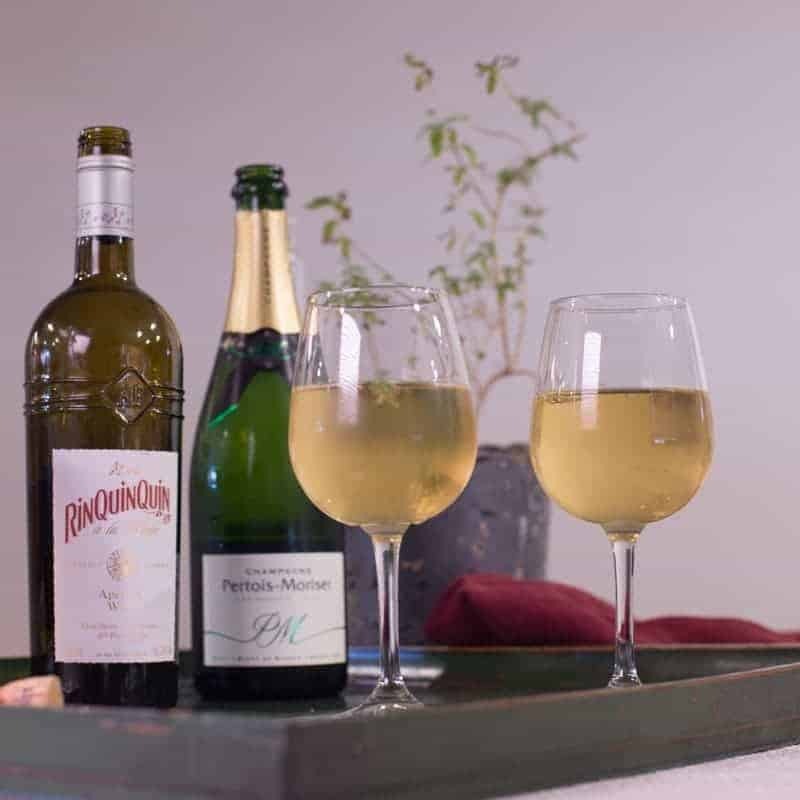 The perfect side when guests are coming. How gorgeous is this salad? 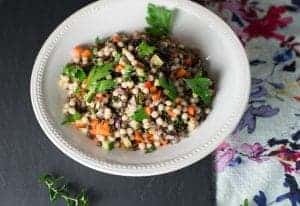 I use the larger Lebanese couscous for this salad but you can just as easily make this salad with smaller Moroccan couscous. The black beluga lentils are awesome because they stay nice and firm and keep well in the fridge without getting smoosh-y. I also love the way they look in this salad. The larger couscous and the black lentils along with the small diced veggies give this dish a little extra sophistication. If you can’t find beluga lentils you can order them here or just substitute your other favorite lentil. This salad has great flavor that gets even better in the fridge overnight. This salad is gorgeous and super tasty! It’s definitely company worthy. I usually make a big batch and then eat it all week. The lentils add a good amount of protein to this pasta salad. 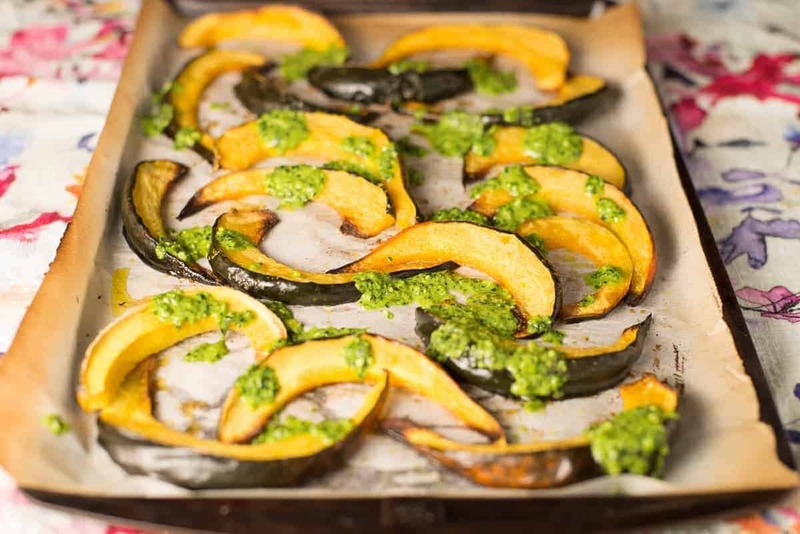 I often serve it on our all-veggie nights with roasted acorn squash and kale pesto. Not doing veggie night? It is also fantastic with broiled or grilled chicken or fish. Easy and super impressive. 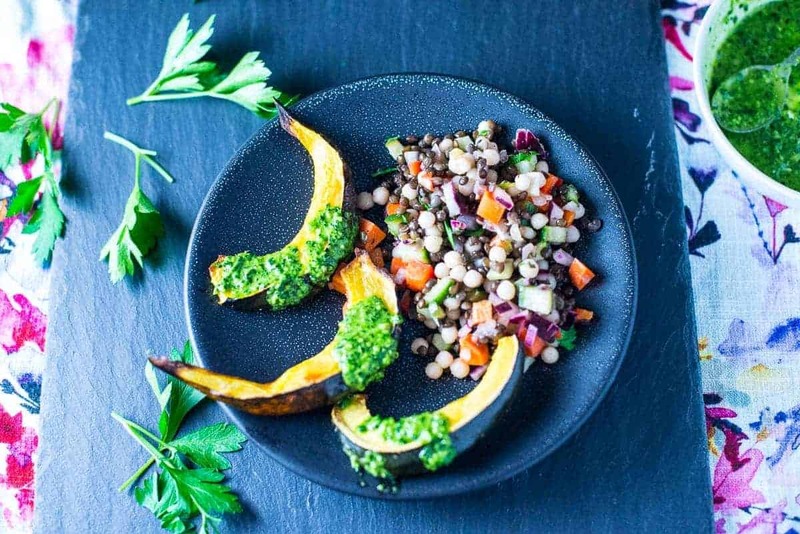 Roasted acorn squash and kale pesto is a gorgeous and healthy dish. 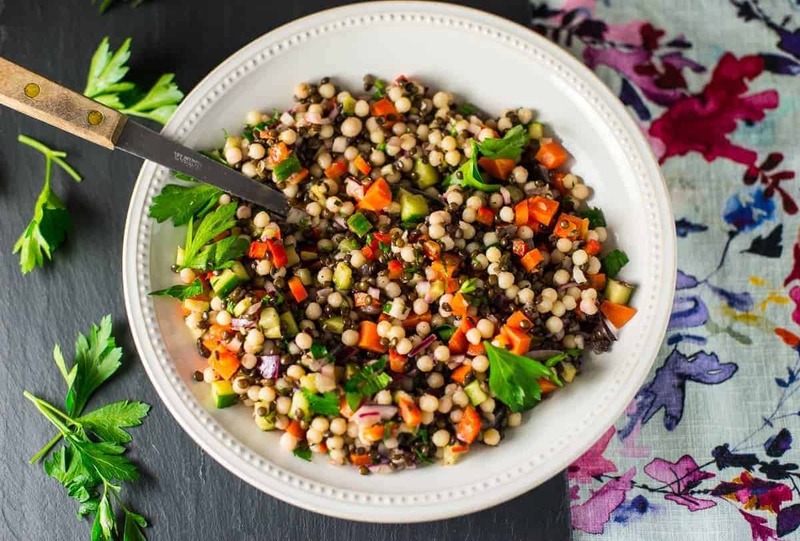 Colorful and delicious – this couscous salad is gorgeous and full of flavor. A beautiful side when guests are coming. This couscous salad also makes killer leftovers. Add diced onion and thyme to lentils. Pro tip: Adding the onion and a few sprigs of thyme gives the lentils extra flavor. Cook according to directions. Drain and set aside. Remove the thyme stems when draining. Dice the cucumber, onion, celery, carrots and red pepper, set aside. Cook the couscous according to directions, drain and put in a large bowl. Immediately add the vinegar, olive oil, salt, pepper, and thyme. Pro tip: Adding the vinegar to the warm pasta helps to give the pasta a more robust flavor. Add the lentils and the veggies to the couscous.